Do you feel your life is out of your control? Perhaps all the time? Perhaps only some of the time? When we feel this way, our stress levels tend to increase and we can become anxious, or upset. These feelings do not bring us peace, nor do they provide us with a feeling of freedom. When we learn how to take control of our own lives, we will know true freedom. Taking control of our own lives includes being aware of who or what is controlling you, and how it’s happening. Perhaps why it’s happening. For instance, if you are always available when your manager needs something from you, even though you must get something done for you, you are allowing it to happen. You are giving your control away and your power. Perhaps you believe if you are not always available, the manager will write you up or fire you. A simple question can begin to help you: “Do you need it right now, or can we schedule a time to discuss it?” This can also lead to a small conversation, however, you are taking control simply by asking it. Sometimes you will get a “no” and sometimes a “yes”. It’s practicing compromise. Another way to help take control of your life is cultivating more acceptance of the current circumstance you find yourself in and not allowing your feelings to be controlled by another. Acceptance does not require you to “like” it. It merely requires you to accept it. When you are able to accept everything in your life…whether it is something you like or dislike, peace ensues. And, again, you feel freer, as you are not bogged down with anger or worry. It’s freeing to feel the acceptance and through this feeling, you can take control. You realize your own power in the situation. You can take control of how you feel, how you think and how you act or react. This also brings a sense of freedom. When we allow others to control us, we are giving our power away. We feel “powerless” to do what we want and need to do. The only person you are responsible for is you. You have the power to control you. By continually using the question and cultivating acceptance of any answer, freedom follows. These concepts can be applied to any person or situation in your life. As you work them into all facets of your life, the way you feel will begin to change. You will feel more in control as you bring back your power. Then, you will know true freedom. 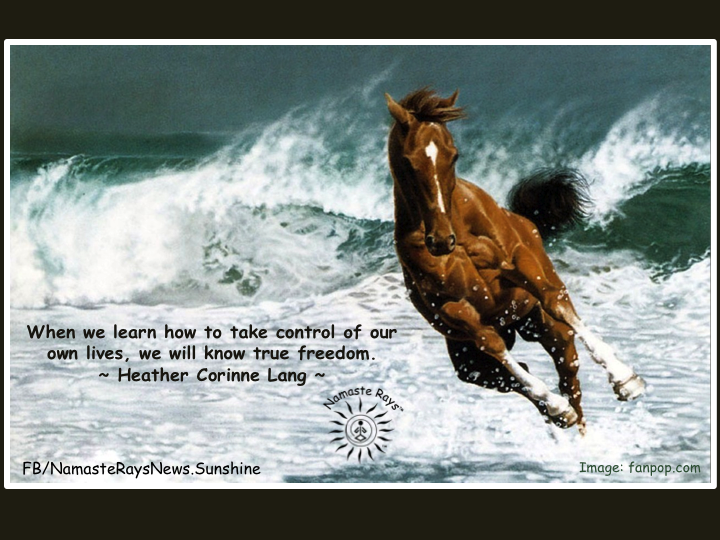 May you take back your power and discover ultimate freedom! Please message me if you would like an energy reading and healing.